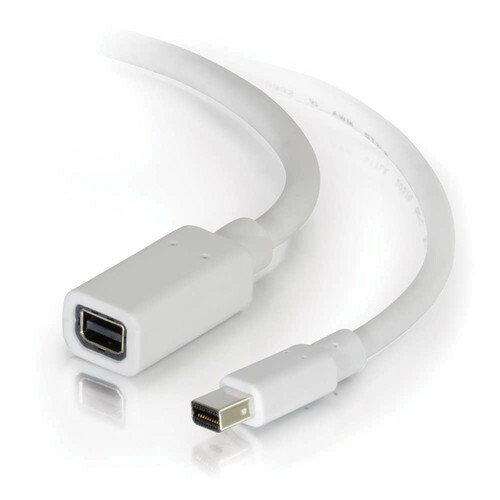 The white C2G Mini DisplayPort Male to Female Extension Cable lets you extend existing Mini DisplayPort cables by 6 ft. It carries a digital audio/video signal and is built to DisplayPort 1.2 standards. Note: This extension cable is not designed to be used with a Mini DisplayPort adapter converter or a Mini DisplayPort adapter cable. Box Dimensions (LxWxH) 8.0 x 5.0 x 0.6"
Mini DisplayPort Extension Cable, Male to Female (6', White) is rated 3.4 out of 5 by 5. Rated 5 out of 5 by Annette from Exactly what I needed. I would buy again. I have connected a Dell monitor to my iMac to use as a mirrored second working station: one standing, one sitting. My bluetooth keyboard and mouse communicate with my iMac from the mirrored work station just fine. The 15' mini display port to display port cable I am using to connect the devices barely reaches so I ordered a 6' mini display port extension cable from B&H. The extension cable works perfectly. I was pleased when B&H came up in my online search for an extension cable because B&H is a company I trust. Rated 3 out of 5 by Rodney from Doesn't work with Thunderbolt Display I thought this might be able to extend an Apple Thunderbolt display cable to attach to a Mac Pro a couple feet away, but it did not work. Will instead be buying a completely new male to male thunderbolt and run it through the port on the back of the display. Rated 1 out of 5 by SIPAnkh from Waste of money I purchased this cable to connect an external 24 Apple monitor as my 2nd monitor to my Apple MacBook Air. In short, I wasted money, it doesn't work, and I was lazy to deal with a return. No clue what I can use the cable for other than to tie something with it. Disappointing. Rated 5 out of 5 by i2i Studios from Works as expected! I had noticed a review stating this extension did not work, however, decided to purchase anyway. Bottom line, it works as expected....needed to extend the Display Port cable on a high resolution photo editing system. Clear display results and no noise, which was a concern. Does this work to connect a mini display port pc to an apple thunderbolt display? As long as the laptop display can be extended to the apple display (dual monitor), don't care whether or not it transmits the sound.